At Mike's Paddle we have incredible teachers and we wanted to give you the opportunity to get to know a few through this series. 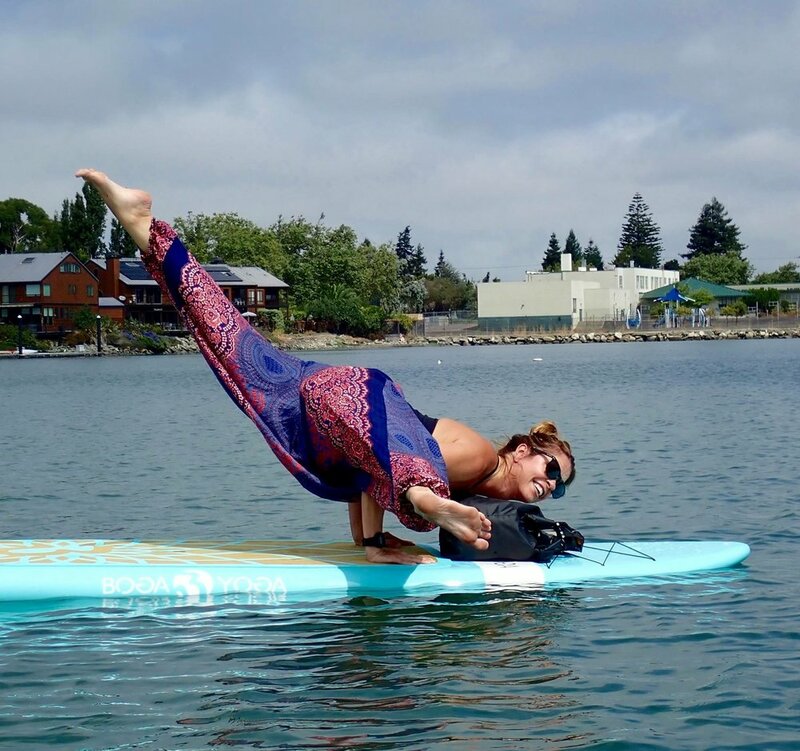 In this segment, we meet Malia Hill one of our beloved SUP Yoga instructors and co-founder of SupAsana East Bay. At Mike's Paddle, Malia Hill offers Boga Yoga Flow and Half-Day Sup Yoga retreats and you can read her full bio here. She also co-leads the SUPASANA SUP YOGA CERTIFICATION PROGRAM which is going to be in June 2018. 1) Why do you love SUP Yoga? I love SUP Yoga because being in nature reminds me of my true nature and how everything is connected. The ebb and flow that is out there is in me too. Also it brings me into the present moment almost immediately. No problem seems big anymore when you're on the water. It also brings awareness, attention and strength to parts of me that I have forgotten about or ignored both mentally and physically. 2) Paint the picture of one experience on the water that you'll never forget? I used to teach on a lake. We sometimes held sunrise classes and it was so peaceful. Just us and the birds and the mist on the water. We didn't tether or anchor so we would just drift from one side of the lake to the other while practicing. Watching the sun come up on the horizon while doing sun salutations on the water is difficult to put into words. You can feel that you are a part of something larger than yourself and it's part of you too. 3) What do you want all your friends to know about SUP Yoga? If your mind is busy, and meditation is difficult, take your practice to the water. Instant presence and awareness is there. 4) When you bring students onto the water, what is your main message to them? The more you allow yourself to relax, the more fun you will have. 5) What's your favorite element that you connect with in your SUP Yoga practice? The water. It's fluid, flexible and immensely powerful. 6) What's your SUP Yoga spirit animal/creature and why? Seals. They are curious and playful. 7) What's your favorite SUP yoga pose? 8) Where would your dream SUP Vacation be? The Maldives. Honduras. My old home, Lanikai, Hawaii. 9) Anything else you'd like to share with the Mike's Paddle community? I'm grateful for each and every one of you. Thank you for being family.